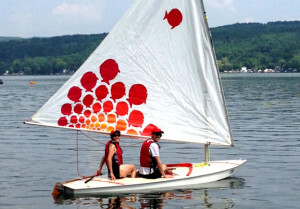 “JETT” is a beautiful 2015 Sunfish sailboats ready for sailing on the Finger Lakes or Lake Ontario waters. Please see below for contact, rental agreement, and payment options. To determine delivery cost to your location type the desired delivery address in map window below. To find deliver cost, multiply the distance times $2.60 per mile cost to deliver. Miles to your location are shown as one-way miles. We charge $0.65 per mile driving four complete trips at the one-way distance. So, one-way miles are multiplied by $2.60 to give the total driving distances made. For other areas of Western New York a delivery/pickup fee will be determined by mileage. Note: September rentals are only available in 3 day on up to a week rentals. Drop-off/pick-up times are after 5:00 pm. 1. Navigational Limitations: The Renter agrees to restrict the operation of the boat to the following described area: The waters of ______________________Lake. 2. Renter declares that he/she is experienced and qualified to handle the boat rented herein. 3. The Renter covenants and agrees that the boat will be operated in a safe and careful manner and with due diligence and shall be returned with equipment and boat in same condition as when taken, ordinary wear and tear excepted. 4. During the term of this agreement the Renter shall be in full control of the boat and it is expressly understood that the Renter is not the agent, servant or employee of the Owner, in any way whatsoever, and that the Owner is not responsible for injuries sustained by Renter, his guests and employees. 5. The boat shall be used exclusively as a pleasure vessel for the safe and proper use of the Renter, his family, guests and employees during the term of this agreement and shall not be used to transport merchandise, nor passengers for hire or for pay. 6. Owner herein assumes no responsibility for weather conditions which may arise or occur during the term of this agreement, and all rates and agreements will continue in full force and effect until the return of the boat to Owner. 10. Alcoholic beverages are prohibited on all vessels. 11. Boat shall be returned by time agreed or an hourly charge of $75.00 for each additional hour or fraction thereof will be due. Q: Do you have lifejackets? Q: Can I tie the Sunfish to the dock overnight? A: You are responsible for keeping the boat safe during times of non-use. Without adequate fenders to keep the boat from rubbing on the dock the Sunfish will invariably become scuffed and perhaps damaged. Q: How do I know what wear has been made to the Sunfish before my rental term?